Why can't I buy a steel Jamis? Discussion in 'Road & Cyclocross' started by proglife, Apr 14, 2008. I've been trying to purchase a Satellite or Quest over the past two months with no luck. I went to two local shops, ready to buy, and both have given me the runaround and don't call me back to let me know what's going on. Are these bikes just that difficult to come by? Is Jamis swamped or something? 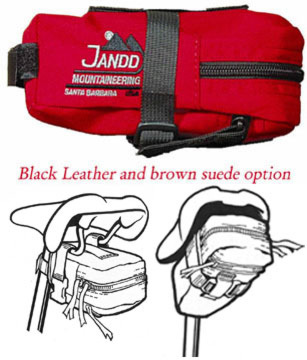 I haven't contacted Jamis directly yet because I understand that these things happen, but either two local bike shops are dropping the ball, or someone at Jamis is not returning their calls. I was set on getting one of these two bikes, but now I'm starting to look at other brands. Is anyone here a Jamis dealer? What's the story? Alternatively, can someone recommend a similar bike? I've been leaning towards the Satellite as it will be my first road bike and I'm not sure I'm going to love it, so I'd be more comfortable with the sub 1000 dollar initial investment. FWIW, I was sized for a 57cm Jamis. I'm fond of Jamis and love the fact that they still make steel quality bikes. Even if Jamis is having distribution issues, the shops still should've communicated the status with you, so regardless, it's the shops' fault and you should do business elsewhere. An alternative is Surly Long Haul Trucker -- yes, I'm biased -- but it is steel. It's a touring bike, but depending on your needs and goals, I might be better suited. Also, just cuz it's a touring bike doens't mean it's sluggish like some would complain and speculate about. And it handles great unloaded. It's my weekday commuter (lightly loaded) and weekend roadie. I was trying my hardest to support local shops, but it's leaving a bad taste in my mouth. I was really hoping to be two months into a regular riding schedule by now. Doing business elsewhere means buying something from a different brand. An alternative is Surly Long Haul Trucker -- yes, I'm biased -- but it is steel. It's a touring bike, but depending on your needs and goals, I might be better suited. 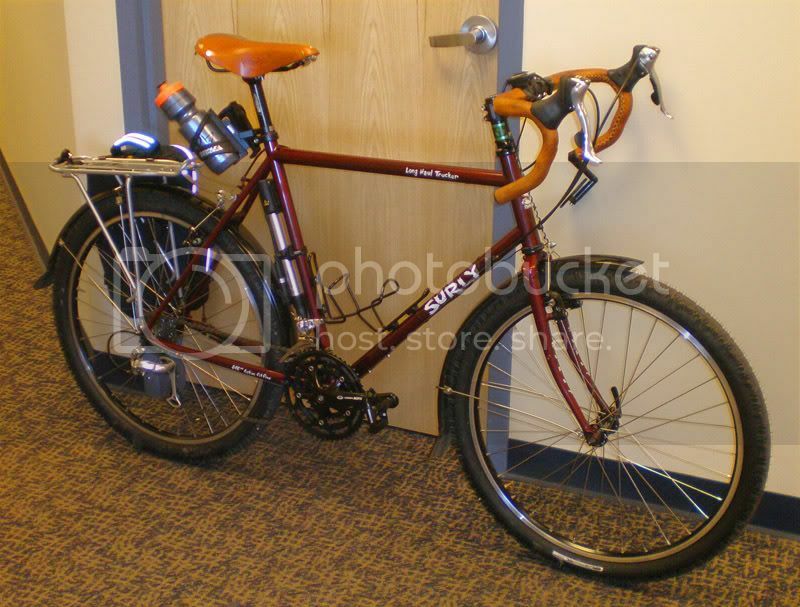 I've considered the Surly's too, but the Long Haul Trucker always looks a bit TOO touring-ish in person. I'm never going to race or anything, but I'd like to be able to go on rides with my nerdy triathlon buddies. testicles in my throat is not a preference, but definitely a bonus. who doesn't enjoy that? Sounds like you've got crappy LBS - or at least crappy LBS employees. Do you have any sort of relationship with the shops? If you want a Jamis and only these two carry them, then I'd give the shops one more chance and be blunt about it asking why they haven't gotten back to you. Surly has the Crosscheck that's steel. There was a thread here or on bikeforums.net recently listing all the known steel roadie mass-produced bikes. I forget where, but it was a good list. Just technically cuz it annoys me, touring bikes can do ANYTHING road bikes can do (and more). And, with respect, if you're not keeping up with your Tri friends, it won't be cuz you're on a touring bike. That bike makes me dizzy in the brain. You die and go to hell! And, with respect, if you're not keeping up with your Tri friends, it won't be cuz you're on a touring bike. No respect deserved. I won't be keeping up with those guys because I'm out of shape and my fatass Cove hardtail isn't a real joy on the road. Walked into a different LBS at lunch out of pure frustration. Apparently they can order, but don't stock, Jamis. He called them right there and told me exactly when I could have one. Quite a difference. wow, I bet the Jamis rep would throw you some swag for letting him know about this situation. but, **** happens. could've been two total flukes randomly in a row, even though i mentioned to the second shop that I came to them out of frustration with shop #1...and then they turned around and did the same exact thing? I'm not a hard to please guy. I'm just trying to give someone my money. Jenson USA has '06 Jamis Eclipse complete for $1300ish. Steel and carbon frame with Campy. Pretty nice. edit: appears they are sold out of 57s. i looked long and hard at that. it's still a good 600 bucks more than the Satellite and this probably sounds ridiculous, but I don't want to be the wheezing slow guy on a high-end bike. Ride what you like (and can afford), screw what anybody else thinks. completely reasonable advice to give to a well-adjusted person. If your local bike shops are treating you lousy and you really want a Jamis, it might be worth it to visit this link and see what's available, and or call these guys at Bicycle Bananas - a real bike shop by the way that happens to also do internet orders. They used to do free shipping and no sales tax as well. They are a high volume Jamis dealer so maybe they even have a closeout steel road bike that will fit the bill for you. Let me know if this works out for ya. Whoa, that shop is near me! Awesome, congrats and post photos when you've got it set up as you like. If I could go with a standard geometry frame, the Jamis Quest is exactly what I would've bought. Great value, great quality. As for liking road biking, just remember to enjoy it as opposed to ALWAYS pushing yourself... sightsee, daydream, get zen. Road biking is a good thing. Just remember the tires are not as forgiving of potholes and curbs as your mountain bike is. i have so many noob questions... i hope you guys don't mind if i occasionally post them here. what are the essential items on a road ride? spare tube and hand pump mandatory? are road flats as common as they are on trails? The best thing I've learned since I starting roading is to pump up my tires to 125psi, regardless of what the sidewall says for max/recommended pressure. Once I did that, no more flats. As for essential tools... flat repair stuff (tube if you want, patch kit otherwise, tire levers, pump/CO2). I also carry a basic multitool and some form of nutrition (energy bar, gel, whatever). I like to afford myself the opportunity to get lost on a ride, and when I do, I want to make sure I don't bonk 20 miles from home. A driver's license or other form of ID is nice so they can identify your body after some azzhole motorist hits you *wink* and a couple bucks just in case you want to hit a minimart for gatorade or whatever. I just thought about it and I do actually do one bit of maintenance pretty religiously on the road bike. That's checking the tires before every ride closely. I've found more crap sticking in them that hadn't quite worked its way thru. Plus if you watch where you're going you can really minimize flats. And staying off the shoulders and out of the gutters where all the crap tends to collect. I carry a spare tube, a small multitool, a couple of tire levers and a couple of CO2 cartridges. I haven't carried a hand pump on the road bike for a long long time. I've discovered that when I start getting flats on the road bike it is usually time for new tires, but I don't ride high zoot tires either. I thought so, until I saw that thing - what the hell is it trying to do? Just find one that velcros around the seatpost and the saddle rails and you're good to go. Doesn't have to be very big either, which is nice. Don't go cheap...I like jandd. My first one lasted over ten years on the mountain bike, and I only had to replace it because my caustic sweat started welding the zipper together. Sidi Dominator 5 Lorica as a road shoe? Are the soles stiff enough on these for road use? I've been riding* platforms on my Cove for years, but wouldn't mind killing two birds with one stone in a pedal/shoe purchase. The better walking ability of the mtb shoes is appealing, too. I'll be using them 95&#37; road/5% mtb. Pics of your bike yet?? Also - where did you end up buying it from?? I'll be using them 95% road/5% mtb. i'm not familiar with that particular model but i use my mtb sidis for absolutely everything. It should be here on Monday. Don't worry, I'll be taking photos like I'm a dot com startup nerd on my honeymoon with my previously out of my league new wife. I'll probably post them on Flickr as I couldn't find many pictures of that particular bike out there on the web. Bought the bike from a shop I found that had them in stock. Wanted to buy locally, but I also wanted to buy 2 months ago. Toshi, thanks for the input. ...I'll be taking photos like I'm a dot com startup nerd on my honeymoon with my previously out of my league new wife. If I could only have one shoe(which I have), I would stick with mountain shoes. I am unimpressed with the durable of my last pair of sidis, so I bought some shimano shoes(no issues except my foot grew) last time and am thinking about trying some Lake shoes next. i've been eyeing that one for quite awhile, i've seen the framesets being sold on ebay by some guy who's had the actual Cinelli's but they don't have Cinelli stickers on them... some sort of closeout sale he got from Cinelli.